The most traumatizing thing I ever saw as a kid–and I saw it repeatedly–was the TV spot for Wes Craven‘s Deadly Blessing with the spider falling into the woman’s mouth. (I know this has been mentioned before on Kindertrauma as a Name That Trauma, but I think it’s traumatizing enough to bear repeating.) The unbearable suspense of the spider descending toward the wide-open mouth still gets to me today. In my memory, it lasts a long time, but I’m sure it was really only a second. It wasn’t just that the image itself was so horrifying, and obviously real; it was the fact that you could be watching your little black and white TV in the afternoon and your harmless show could be interrupted, with no warning, by this scene that was intensely creepy and repulsive. I couldn’t believe they were allowed to show such a disturbing thing on television! And yet every time it came on, I couldn’t look away. On a different note, I have great memories of watching Hammer movies (on that same black and white TV) with my father when I was young. 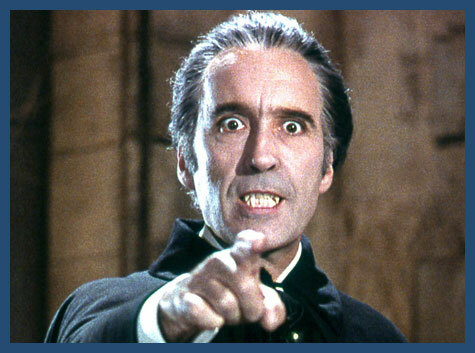 We would stay up late and watch Christopher Lee as Dracula, trying to catch as many of those Hammer Dracula movies as we could. When my father died a few years ago, that was one of my fondest memories. Now for the self-serving part. I started a blog last month called Senseless Cinema , a response to comments that movie reviewers sometimes make about films that are so weird or poorly made they seem to come from another universe. The conceit of Senseless Cinema is that those movies are in fact from another universe, and I have traveled from that universe to set people straight about the brilliance of these films. I defend movies that are generally considered terrible in a way that comes across as (I hope) pompous and at least occasionally humorous. So far I have covered movies like The Nightmare Never Ends, Demon Wind, and Shriek of the Mutilated (another Name That Trauma).